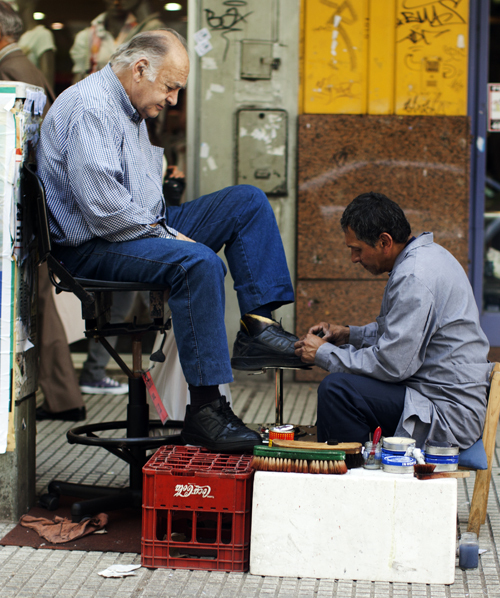 I watched this typical “street shoeshine” scene from my car while we drove to an appointment in Buenos Aires. Nothing particularly special…until!…the shine administrator wrapped a plastic cuff around the left sock of the client to protect the client’s sock from the shoe polish. This might be common practice in some communities but I, personally, have never seen that maneuver. Recently there has been a big, bordering on huge, trend towards old school barber shops opening in New York City. I would love to see an equal re-emergence of shoe shine stands. Maybe they should be inside the barber shops (hint, hint). I mean, I’m doing nothing but looking at old magazines while I wait for my turn anyway, why not get a shine! Great photo! I Love shoeshine stands! Interesting you mention shoe shine stands in barber shops; right in downtown Savannah–on Bull near Broughton–is a small, old-style barber shop with an old shoe shine guy who has become a fixture. It's a shame you didn't notice him when you were here; he has a classic, Black Savannian style and a fascinating face. haha!! so the one that we have here in GRAN VIA (madrid) is lying huh? he says… EL MEJOR LIMPIADOR xD they all should be like him!! Take the subway or an airplane and you will still see plenty of shoeshines. Yes! And a manicure, neck and shoulder massage and light lunch, haha. I am 23 and love to have my shoes polished. Airports are usually the spot for me, but always keep my eyes peeled for a nice spot on the street. The plastic cuff for protecting socks (and pants too) is nothing out of the ordinary. I'd say it depends on the quality of polisher – if he has quality materials & equipment, etc., expect the cuff. i didn't belive it still existed shoes polish man! What a cool picture. Stuff like this makes a community/city special. If you look, you can find plenty of shoe-shine stands in NYC, especially near the courthouses. Whenever I would get a shine in San Francisco, the gentlemen doing the shining would slip a couple of playing cards between my shoe and sock. It seemed to do the trick. Really? Are you kidding me? This guy is getting his black tennis shoes polished? Real sartorial. Also, the sock protection is pretty standard. Here here for more shoeshine stands outside of airports and some hotels. I am relagated to going to the nearby Nordstroms for a shine. Good work but there needs to be more. In Portugal this kind of practice is very common, including the protection of the sock. What's truly striking about this photo is that he is getting his SNEAKERS shined. What a fastidious gentleman. man, this guy is working hard! love how there are shoe polish guys at almost every corner of those busy streets in BA. must have been a trek driving a car through the city. the thought never even passed my mind when i lived there. I agree! Love the picture too! This is beautiful, but still painful for my heart.. There are shoe shine stands in Grand Central. And some shoe repair stores in the city even have the raised up shoe shine chairs inside the shop. I know my shoe repair guy in Astoria has one that I always admire. Sadly, I don't think it's common practice for women to use shoeshine stands . . . a little unladylike I suppose. I like the idea that the shine administrator managed to use some old coca-cola case for the customer's other foot to rest on. This photo says a lot about daily life. In Lisbon you can see them everywhere and they also use the sock protection. love how he is getting his black sneakers shined! too funny. I'm South American and these shoe-shining stands are very common. I love how a country such as Buenos Aires remains so authentic…it's the city version of a vintage store. this is my city! and i become you're fan! I love how he is getting black runners polished. That has class. Maybe my sense is wrong, but I always feel quite uncomfortable about the class discrepancy and weird servile dynamic of getting one's shoes shined. I'm a woman and as another commenter noted, women don't seem to get their shoes shined, but even if they did, I don't think I'd feel comfortable receiving one. Great photo, though, as always. Mexico City has the best shoe shiners in the world. The other day my friend @ErickIslas was walking on the street with this adorable pair of brown shoes when this super stylish 'bolero' stopped him, kneeled down, pulled his box-stand up front and started shining Erick's shoe. Out-of-nowhere. He goes 'look at the way you've got your shoe, sir.' Shaking his head in disapproval, expressing a serious concern with this gentleman's look. How about that kind of treat? you are the best, honestly..
i mean, you delight me everyday with every picture you take. In Sydney's strand arcade they have a stand for shoe shiners, and they wear uniform ! Get the cool… get the cool shoeshine! I knew a wonderful man named Milton that did old school shoe shine in Portland for years at hotels. I always wondered why more people didnt do it. He told me that it used to be common but people today feel like it is cruel or demeaning to have another person shine their shoes. 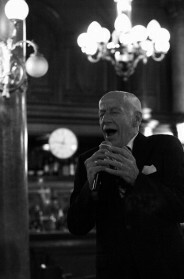 They do so many things in charming "old fashioned " ways here ( Buenos Aires).. The way tailors fit you when you need alterations, the way shoemakers repair things, down to the way they wash the sidewalks early every morning .. I remember Nordstroms in the US used to have a shoe shine man in the mens shoe dept. What I find interesting is that the sneakers look like the K-Swiss ones that I am wearing now. I live in Argentina, and its really common to see shoe shine stands that make the same thing, they really have thought their business through! Most of them are on the streets, but i´ve seen one in a mall too.. while we buy, men get their shine! but how do they manage wothout it? have seen shoe shiners in penn station at the shoe repair shop. Totally agree. I'd love it if Paul Mole got some well-trained shoe-shiners. Certainly would make for a full experience: cut, shave, shoeshine. Very rejuvenating, powerful stuff indeed! I agree, in Australia people are starting to understand quality in footwear and one shop in particular has embraced that. The Cloakroom in Brisbane offers shoe shine services as well as making made to measure suiting and shirting!! Here in Brazil the "shiners" do the same way. Great pic!! in Uruguay, my country, there are many "street shoeshiners"…we are "old fashioned" in the Rio de la Plata!! did you take photos of street styles in Buenos Aires?? I love the pics you posted of the city!!! IT'S VERY COMMON HERE IN B.A., THEY ARE EVERY WERE, BUT THE NICEST ARE AT "GALERIAS PACIFICO"
I'm in Michigan right now and we have an amazing place called the Gentleman's Choice, an old style barber shop with an in-house shoe-shine stand. Unbeatable. Got one of my first old fashion shoe shines this weekend. Something I will be doing far more often. I was born and raised in Buenos Aires! This post is lovely. Thank you! in portugal, we still see a lot of this. Have ever had yours shoes polish in Brazil… when they start polish promply with a cloth …you can hear a swing sound like samba!A-M-A-Z-I-N-G! If you really liked this you should come to Portugal. Here's lots of uncommon things as you said. The idea of a shoeshine in a barber shop is brilliant. I've always thought it would be nice to have a foot massage while getting a haircut, but I'm not sure I could work myself up to that much entitlement. sure the idea ideaof shoe shines around barbers and subway stations is great. the "leather"(esp. the sneaker type) used for ordinary shoes is coated with resin-laquer that will not allow wax to osmote into the materials surface..
only the handmade ones allow that. former employees of lehmans no in the polishing business should carry hand soap and sponge and soft teeshirt material+nano shine for car detailing to shine modern shoes. Great idea. Here in Düsseldorf (Germany) I know one or two shoeshine. They are traditional and also wrap something around the socks. romantic and useful both, but in nyc barber shops? who would pay a decent wage to have a shoeshiner…. I love you Scott. You keep romance alive. in mexico city, its a big big practice…. i will send you a couple of classic corners were they do it. they always give a newspaper and offer you a cigarette. Thanks for keeping the romance alive, Scott! So many insightful little acts of measure across the world that we can put into practice here in America – hopefully! I'm getting my shoes (Mr.Hare shoes! )polished once a week at the Burlington arcade, London and I enjoy every second of it. Takes you back in time! I love this idea. I used to shine my own shoes regularily once a week to keep them in good trim. Back in my '20's. Now, I don't have time, but I love the look of shoes that are well-maintained. They use them in Spain and Mexico. your pictures are truly inspiring ! I can t believe you were in Buenos AIres! Mi city! I always dream that you find me on the street en shoot me with your camera!!! When i was in Florence thaught it could happen, but my tourist-like look wouldn t catch your attention. THE MOST GLAMOROUS SHOE SHINE IN BUENOS AIRES IS LOCATED AT PATIO BULLRICH. This picture makes me love my city even more (if possible). Old school charm! I see them everyday, they're in every corner in the Courts/Law firms area!!! And he's getting his sneakers polished! never seen that! amazing! how come you didn't even mention the guy's not even gettins his SHOES done.. they are sneakers!!! leather sneakers, that's all!! i grew up and live here in buenos aires, and this is so common to be seen.. there's a stand INSIDE a very luxurious mall, "galerias pacifico"
you should've get your shoes done while here!! I agree that shoe-shining stands should make a comeback, but it's a practice best left to those wearing dress shoes. Shining sneakers is a bit tacky and obsessive. lovely image, very nostalgic, i love it. I was just writing earlier this week about how i would love to see some of the pictures you would take in Buenos Aires. I love some of the fashion trends here! Bs As is stuck in the 80's! Did you maybe take this on Lavalle or Florida? Post more pics of Bs As! There's a show shine in Trim Salon in Nashville, TN on the guys side. You should visit! In Dominican Republic u can find them every morning in any public park, ready for anyone. But the idea shoe shine mix with old school barber sounds pretty good. Greeting from Barcelona!!! The "King" at Fader's Cigar shop in Baltimore used to protect your sock…best shoeshine I ever had. Cigar, the paper and a shine. Heaven. It's so interesting to see how something shoe shining can still be done in these modern times. I've lived in BA for 5 years and to date the best shoe shines I've even received are from here- courteous, attentive, professional, friendly. I don't agree with the comment made that "it breaks her heart." Why? Just because you don't want to shine shoes, it makes it a bad job? In my experience the men who shine shoes here are proud of the work they do, as it is often a tradition in the family. And secondly, as this photo proves (they are just sneakers), there is often very little or no class difference between the customer and the shoe shiner- it isn't and shouldn't be an uncomfortable situation. Beautiful photo. I'd love to see more from BA! I can't believe you were in Buenos Aires!! And no other pics? 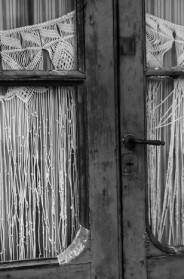 I thought you would find interesting styles around, let us risk, San Telmo. Our shoe-shiners are very thoughtful indeed. Some poeple take more tan one pair at a time to collect them later, al shining as new. Just like you, I was quite surprise to see this kind of activity in Buenos Aires. One day I was at the 9 de Julio Subte station and I saw in one of the halls, a place where they cut your hair and shine your shoes at the same time. It was unbelievable and very cute to see. I finished my time with a beautiful tango show that an Argentine friend recommended me. It was an outstanding Tango Dinner Show at Esquina Carlos Gardel that I book trough http://bsas4u.com/ it was such an incredible experience that allowed me to know more about Buenos Aires culture and traditions. That plastic … is a very common practice in México. Great shot! I love my city and thank u for visit us. Tango, "limpia botas", boca and love! The practice is common in my native Colombia, as well. One reason I like getting my shoes shined at airports is that most of them use the plastic sock guards. So simple and so effective. When I look at this photograph, the first thing I notice is how the difference of socio-economical status reflects on our bodies. I don't feel that it is a coincidence that the customer is a well-fed gentleman and the polisher is a tiny man. I'm just trying to say that this picture speaks many more 1000s of words than it looks. More than thoughtfulness, more than fashion…just more. POR FAVOR give us more pictures from Buenos Aires~~ Europe and NYC are great, but I'd love to see looks from the global south! Is it me or is that old guy the guy who owns Harrods. What confuses me even more is that he appears to be wearing trainers. This practise has nothing special! In Mexico it's very common. I'm from Mexico and I have never seen a shoe-shiner who doesn't do that. It's part of the process. We have the same in Brazil. And they also have the sock protection stuff. In NY, there are a few barber shops with shoe shine boys. Check out the barber shop on E41 between Park and Lex, or on E27th between Park and Lex. Super hot. Also, new shoe shine place in the Met Life building above Grand Central has a shoe shine/barber shop in the lobby. You should check out the Hurricane Club — get a shoe shine while you are having a mojito! I love the politics in this photo. The two men is wearing the same outfits. The roles might been switched.